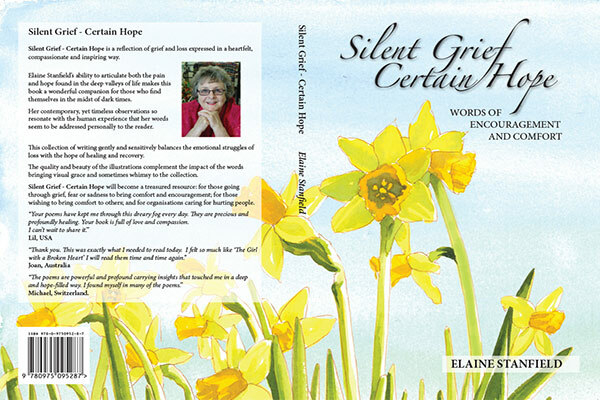 Silent Grief - Certain Hope is a reflection of grief and loss expressed in a heartfelt, compassionate and inspiring way. Elaine Stanfield’s ability to articulate both the pain and hope found in the deep valleys of life makes this book a wonderful companion for those who find themselves in the midst of dark times. Her contemporary, yet timeless observations so resonate with the human experience that her words seem to be addressed personally to the reader. This collection of writing gently and sensitively balances the emotional struggles of loss with the hope of healing and recovery. The quality and beauty of the illustrations complement the impact of the words bringing visual grace and sometimes whimsy to the collection. Silent Grief - Certain Hope will become a treasured resource: for those going through grief, fear or sadness to bring comfort and encouragement; for those wishing to bring comfort to others; and for organisations caring for hurting people. Jesus said, 'This voice was for your benefit, not Mine. Now is the time for judgment on this world; now the prince of this world will be driven out. But I, when I am lifted up from the earth, will draw all men to Myself'. An oracle concerning Babylon that Isaiah son of Amoz saw: Raise a banner on a bare hilltop, shout to them; beckon to them to enter the gates of the nobles. I have commanded my holy ones; I have summoned my warriors to carry out my wrath- those who rejoice in my triumph. Listen, a noise on the mountains, like that of a great multitude! Listen, an uproar among the kingdoms, like nations massing together! The LORD Almighty is mustering an army for war. Announce and proclaim among the nations, lift up a banner and proclaim it; keep nothing back, but say, Babylon will be captured; Bel will be put to shame, Marduk filled with terror, her images will be put to shame and her idols filled with terror.